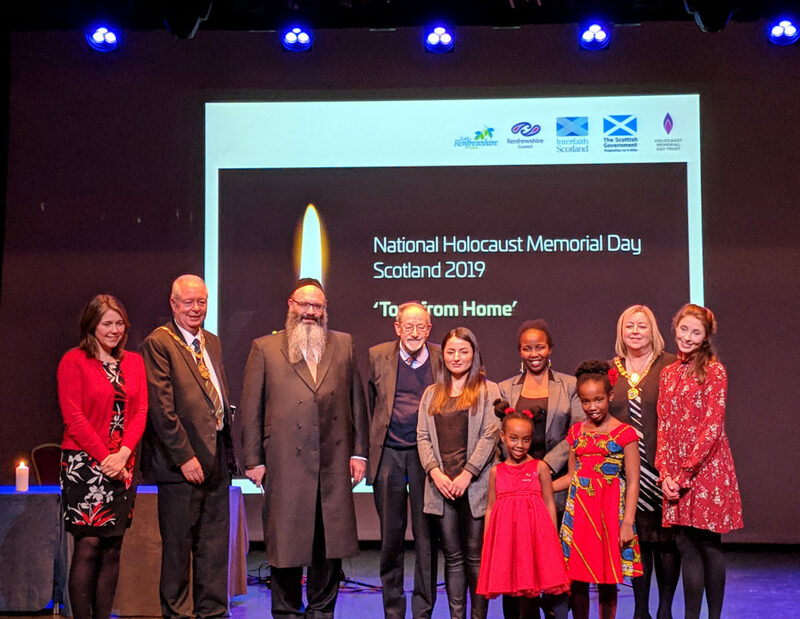 On Monday 28 January the National Commemorative event for Holocaust Memorial Day (HMD) 2019 took place in Glasgow. Organised by Interfaith Scotland, Holocaust Memorial Day Trust and partners, the event started with the viewing of The Yazidi exhibition by renowned artist, Hannah Rose Thomas, and Gathering Voices, an exhibition that portrays the Jewish contribution to Scotland. Speakers at the ceremony included Cabinet Secretary for Communities and Local Government Aileen Campbell, the Provost of East Renfrewshire Provost Jim Fletcher and the Provost of Renfrewshire, Provost Lorraine Cameron. Speeches were made by Martin Stern MBE, who told his personal story of surviving the Holocaust, Hannah Rose Thomas, who spoke about her experience of leading an art programme with Yazidi women, and Delkhwaz Haciy, who is on the board of Yahzda, an organisation supporting the Yazidi ethno religious minority. To mark the 25th anniversary of the genocide in Rwanda the Rwandan poem, Children of Survivors, was recited by Carmella and Lainey Rubayiza. The event also featured musical performances from East Renfrewshire School’s String Octet and Paisley Grammar Celtic Ensemble.